Hypnosis is a natural state of mind that we enter into many times a day, for example when we are daydreaming, just before we go to sleep and even when we are watching television and can be described as nothing more than a relaxed focus. It is a very pleasant and relaxing state where one's awareness is heightened, and contrary to popular belief you will not lose awareness or control. It is in this trance like state that the conscious part of our mind is bypassed and we have more access to the subconscious. We also know that this is when we are most susceptible to suggestion. Hypnotherapy uses this trance like state to bypass the conscious mind and access the subconscious directly. In a therapeutic setting hypnosis provides a very powerful tool to access subconscious patterns of thought and behaviour and resolve issues that lie beyond the capabilities of conscious resolve. It can help with many issues and problems in life including addictions, anger, blood pressure, blushing, lack of confidence, insomnia, IBS, relationship/marital difficulties, migraine, nail-biting, nightmares, obsessions, pain control, panic attacks, phobias, sexual problems, skin disorders, stress, trauma flashbacks and weight control. Hypnosis is a normal and natural method of altering someone's state of consciousness. It is very pleasant and relaxing, has no harmful side effects and is suitable for just about everybody. It is a safe, reliable method of treatment for many problems you’re finding hard to handle on your own - thoughts and actions you'd like to banish or acquire, or emotional suffering that is too overwhelming or has gone on too long. Stress or anxiety can be a common complaint in today’s society and most people encounter it at some point. A certain amount can be dealt with naturally, as long as it stays within our “safe levels”. When it becomes too much for us to cope with it can affect our quality of life. Excessive or prolonged stress can lead to illness, physical and emotional exhaustion, increased anxiety or even panic attacks. When we come under excessive pressure from our home, work or social factors, we tend to respond with either anxiety, anger or depression or a combination of all three. Hypnotherapy can help with the ability to cope in different situations in a calm and effective way. You should be able to control your anxiety levels and have a calmer, more confident approach to all situations. Its success can be aided by the use of self-hypnosis and/or a relaxation CD, recreating the calm state experienced during the hypnotherapy session. As a part of my treatment you are given a free relaxation hypnotherapy cd to take home - regular listening can help provide a powerful and natural way to release stress... and the less stress we have the happier, healthier and more confident we feel. Around 12 million adults see their GP’s with mental health problems each year - most of these suffer from anxiety and depression, much of which is stress related. Insomnia and interrupted or troublesome sleep is more common than many think, 30 to 40 % of people suffer with some level of sleep problems during some part of their lives and in fact a large proportion of my clients report that their sleep is not how they would like it to be. This difficulty in sleeping can have a tremendous impact on the sufferer’s day-to-day functioning, making us feel sleepy or fatigued, effecting our concentration and motivation, but even if we know why or believe we have a reason why, it doesn’t make the problem go away. At the initial consultation I will explain why certain patterns of thinking or behaviour may contribute to your sleep issues. I will then explain how Solution Focussed Hypnotherapy can help you on a sub conscious level to move you forward to better sleep. By teaching you how to relax before sleep is a significant part of the therapy. Deep relaxation is a pre-cursor to sleep and without it sleep will elude you. The most effective way to treat insomnia completely and permanently is to resolve what’s causing it. The most common cause of being overweight relates to the individual's attitude to food - it’s not just a matter of choice but also a matter of conditioning laid down in childhood and throughout life. Your attitude to food and eating is the most important means of losing weight and that’s where hypnotherapy comes in. Under hypnosis the subconscious can be allowed to form fresh perspectives on how what and why you eat. It’s not so difficult once your subconscious mind better understands the role of food. Old childhood behaviour patterns are updated so that food is not used for comfort at times of stress, making the task of losing your weight so much easier. You gain control over your eating habits as your shape changes to a more healthy you. Hypnotherapy can be an effective and powerful tool for the eradication of unwanted habits including smoking. The physical addiction to cigarettes is actually a small proportion of the problem - the rest is in the mind, which can be re-educated. I explain how the subconscious mind has created such a dangerous habit, remind you of the dangers to mind and body of smoking, and how hypnosis can help you to move forward to a healthier life. • Difficulties in thinking, concentrating etc. Some of the above symptoms can be treated specifically with hypnotherapy - insomnia, eating disorders and lack of concentration are examples. Often depression is exacerbated or even caused by substance abuse - alcohol, drugs or cigarette smoking. With appropriate hypnotherapy, depression is one of the most treatable disorders. It has dramatically lower rates of relapse than with anti-depressants alone and is now considered the most effective treatment, even in severe cases, enabling the client to focus on solving problems and engage fully in life again. The origin of a phobia can be associated with a traumatic or unpleasant event earlier on in life, although it can also be triggered during a time of high anxiety. The subconscious, noting high anxiety, steps in with panic behaviour which can then begin to associate with an object, place or event. Fears and phobias can be extremely debilitating and restricting in many areas of life. Using hypnotherapy, phobias can usually be resolved within three to five sessions. The process can help the person to disassociate from the fear/phobia, using specific techniques that enable the emotion to be taken out of the experience. More realistic patterns of thought are then developed helping the individual’s subconscious become indifferent to the particular object of fear so that they will be less affected by it in the future. With solution-focused hypnotherapy anxiety can be reduced, unwanted behaviour patterns eliminated and subconscious processes developed to be more optimistic and motivated to succeed. This is part of the successful treatment of problems areas such as public speaking, interviews and exams. 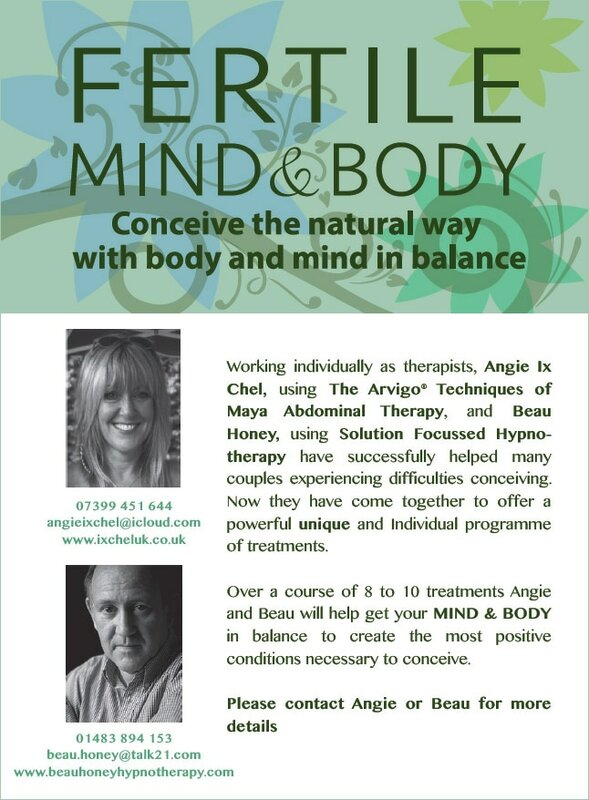 Working individually as therapists, Angie Ix Chel, using The Arvigo® Techniques of Maya Abdominal Therapy, and Beau Honey, using Solution Focused Hypnotherapy have successfully helped many couples experiencing difficulties conceiving. Now they have joined forces to offer a powerful unique and Individual programme of treatments. Over a course of 8 to 10 treatments Angie and Beau will help get your MIND & BODY in balance to create the most positive conditions necessary to conceive. The above are just a few examples of the most common issues, there are of course many other problems and conditions that can be effectively treated and resolved through hypnotherapy.